Sorbus aucuparia Edulis is a cultivar of Rowan tree that produces bright orange-red edible berries that can be used to make Rowan Jelly. The dark green leaves comprise of 4-9 pairs of leaflets. The creamy white flowers are produced in clusters from May to June. The fruits are grow in clusters, first appearing green and gradually ripening throughout the summer time to a bright orange-red colour. 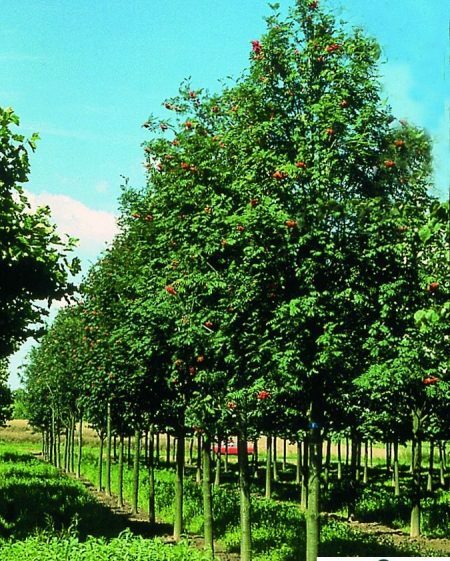 Mountain Ash Edulis is a tough and hardy tree, tending to prefer cooler spots and it will thrive on most soil types and forms a broadly oval shape at maturity. Mountain Ash are a good choice for gardens, bringing year round interest and food for birds and you!